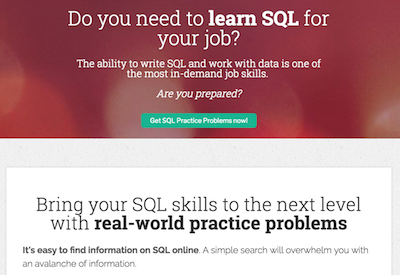 Cover the basics of SQL. Many intermediate-level resources didn’t make this list for that reason. Not a vendor’s manual. 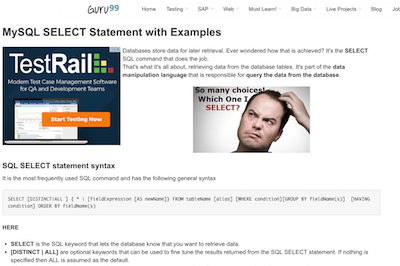 While the Oracle and MySQL documentation can explain the syntax, other places are usually better at explaining SQL. Several resources were found in my research but not included in this list. Also, there are several websites that offer paid courses (Lynda, Pluralsight, Udemy). Each of them has hundreds of SQL courses. 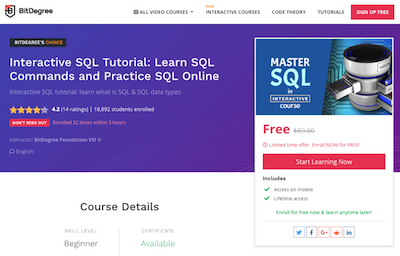 Rather than list them all individually here, I’ve deliberately listed one entry for each, and you can visit each website and decide which course is the best way to learn SQL for you. 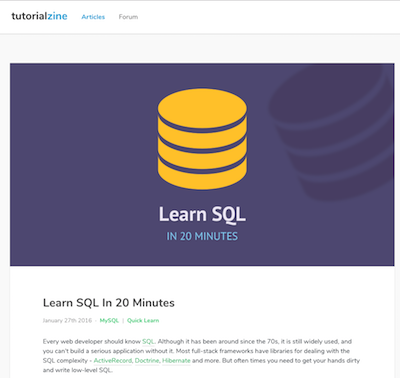 I’ve listed over 50 tutorials here for learning SQL. 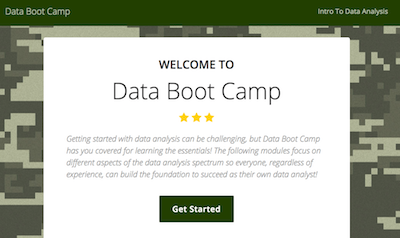 Don’t want to sift through them all and just want to learn from a good quality tutorial? Click on each of them to be taken to that place in this guide for more information. Which SQL Distribution Should I Learn? 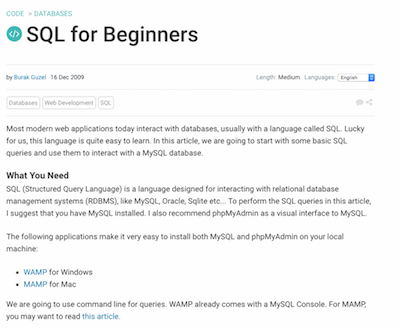 This list contains resources for learning many different types of SQL: Oracle, SQL Server, MySQL, PostgreSQL, SQLite, and more. Which version should you learn? 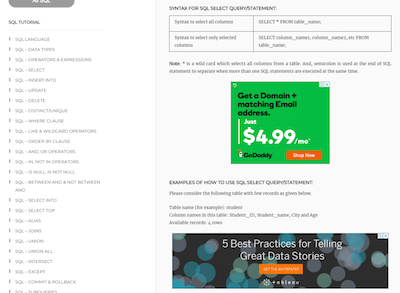 And does it matter?These versions of SQL are offered by different vendors. They are all based on the SQL standard language, which is probably about 80% of their features. So, learning one vendor’s SQL makes it pretty easy to learn another vendor’s SQL. Oracle: database is targeted towards large organisations, but they also offer a small, free version called Oracle Express. SQL Server: a Microsoft database, also targeted towards large organisations. Good integration with other Microsoft technologies. 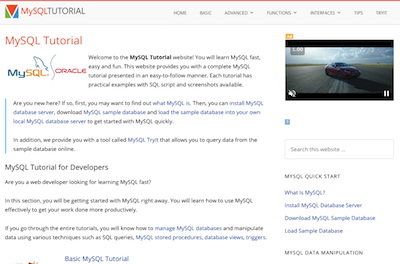 MySQL: this is a smaller, free to use version of the SQL database, that uses the standard SQL. It doesn’t have the capabilities for larger systems that Oracle and SQL Server have, though. PostgreSQL: another well-known free to use database system. Comparable to MySQL. I haven’t used it so I can’t comment much on it, but it has a pretty wide usage. 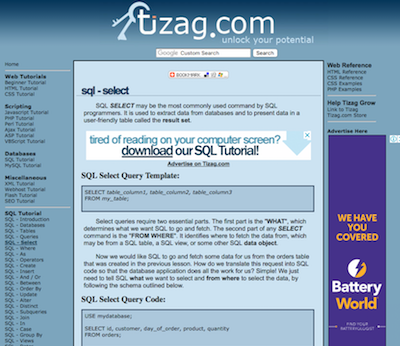 SQLite: a free standalone database, often used in small applications and mobile apps. So which version should you choose? I think it depends where you want to go with your career. Web development for small/mid-sized projects or personal projects? MySQL or PostgreSQL. These are just general suggestions. You can easily switch between types of SQL databases after learning the differences and syntax related to it. 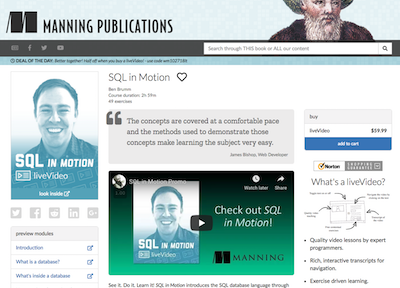 This section includes text-based tutorials such as blog posts or articles on websites. 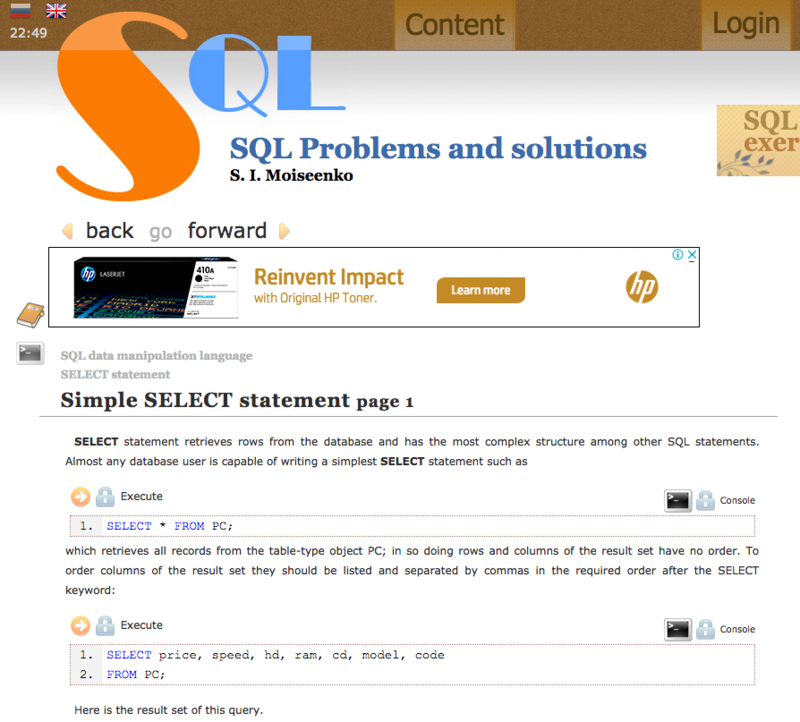 This site includes some short explanations on each of the SQL topics with several examples. 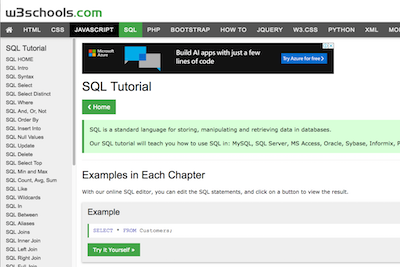 This tutorial looks like some of the other text-based tutorials such as W3Schools. I found the explanations to include poor English. I also noticed that each link on the sidebar opens in a new tab which may be annoying. It teaches joins as using the WHERE clause rather than ANSI joins. This tutorial focuses on using Chartio’s BI tool. On first impressions, it looks to be good quality. Explains SQL concepts well. Uses SQLite. 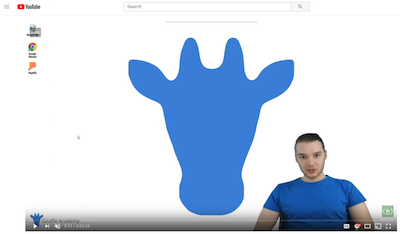 A good quality PostgreSQL tutorial. It has a video course for a more in-depth tutorial that can be purchased. This tutorial has short posts, but the explanations are good. It includes an SQL sandbox but it does not load. This site has a lot of ads on it, making it hard to navigate. Some of the topics are only covered briefly. However it does include an SQL editor which is a bonus. 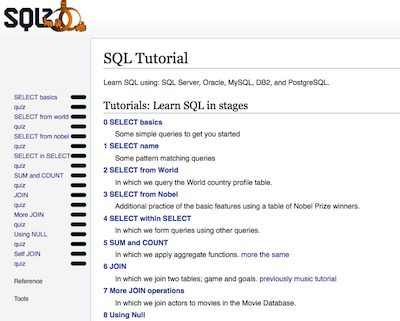 This page contains links to articles on many different introductory topics in SQL. Each topic is explained well. The only criticism I have is that the page isn’t laid out very well – beginner topics are mixed in with more advanced topics. A tutorial on MySQL and PostgreSQL. Seems like a good quality tutorial. One minor criticism is that the SQL code uses backticks ` instead of single quotes ‘ for strings, making it hard to copy and paste. 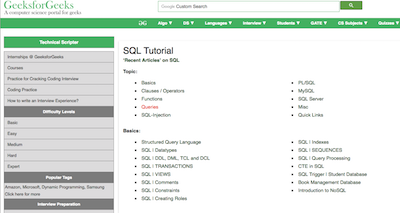 The tutorial covers many types of databases (MySQL, MSSQL, Oracle, DB2, SQLite, PostgreSQL, MariaDB). 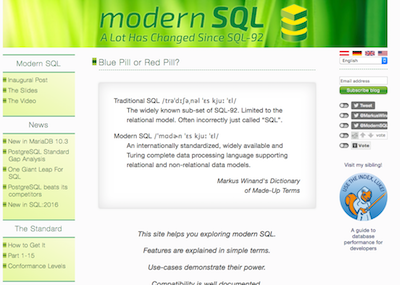 Focuses on “modern” SQL such as new features. This site has a good layout. 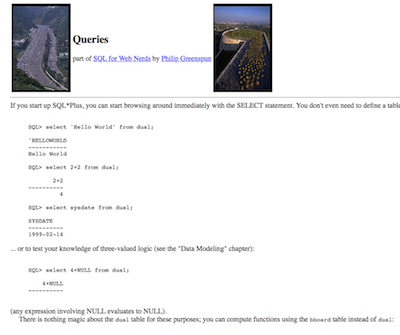 It uses their Mode tool to practice SQL. You need an account for this to practice, but it’s free. It seems like a good quality tutorial. 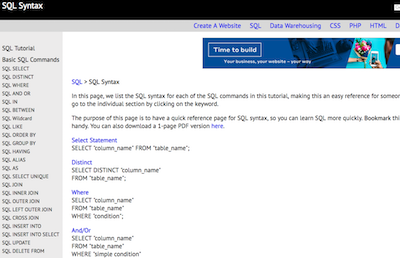 Their “Try It Out” section is helpful, as it lets you run SQL queries. It’s a useful tutorial but the site looks like it hasn’t been updated in a long time. It’s based on Oracle 10g which is quite old. A neat looking tutorial on PostgreSQL. It only covers some of the basic topics (some features of SELECT) and leaves out a lot of others. 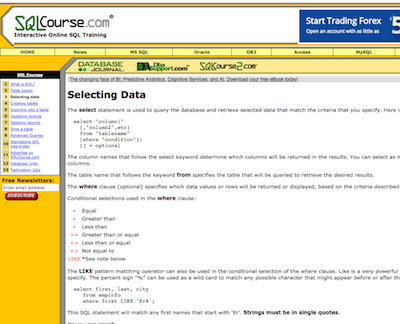 Follows a standard layout of the topic list on the left sidebar. The explanations are OK and it includes a lot of topics. The site is easy to read and navigate. 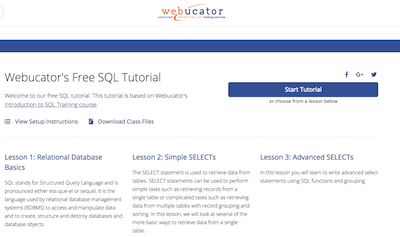 It has a short explanation of different concepts and has a practice SQL feature for each lesson. 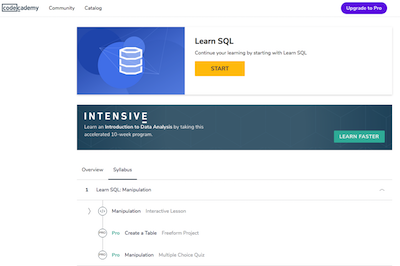 It looks like the same course as sqlteaching.com. It uses SQLite. 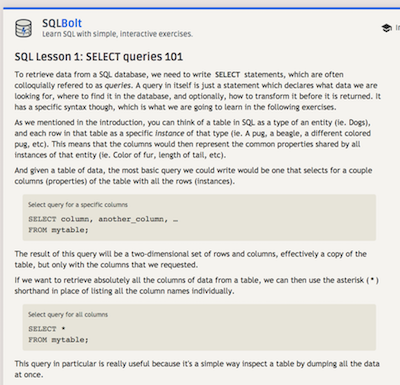 It has a short explanation of different concepts and has a practice SQL feature for each lesson. 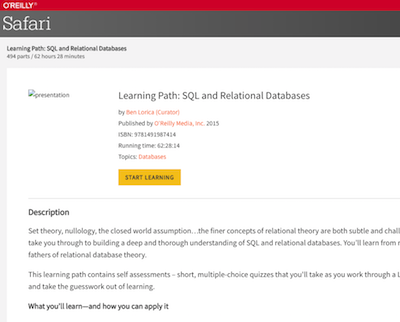 It looks like the same course as sql-easy.com. It uses SQLite. Each topic includes a short explanation and several examples. It covers a lot of the basics of SELECT statements. The navigation on this site is a bit hard to follow, but the tutorial seems quite thorough. 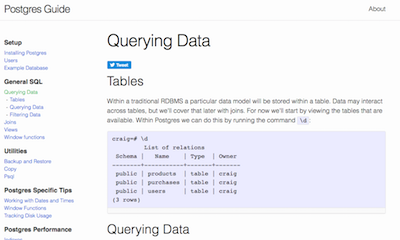 This tutorial includes code and database diagrams and seems pretty good. Very highly reviewed online. 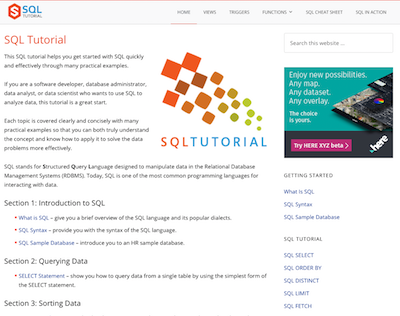 Has a good tutorial, exercises, and the ability to practice your SQL queries. Uses SQL Server, Oracle, MySQL, DB2, and PostgreSQL. 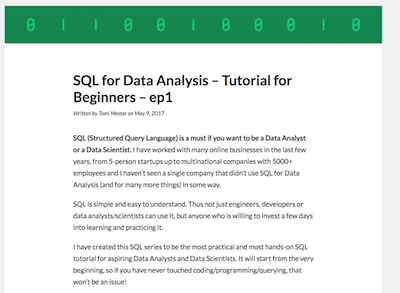 Not a tutorial but has SQL exercises and a practice area. Highly reviewed online. 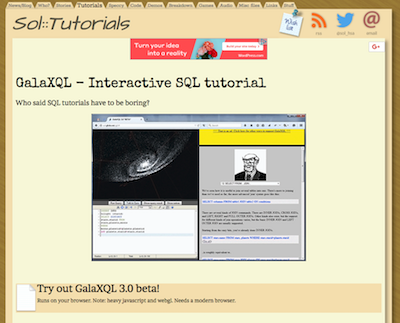 Has a good interactive SQL feature and good exercises. This seems like a thorough tutorial. I found the navigation hard to follow. The explanation of topics seems very formal and a bit hard to get started with. This seems like a good tutorial. I found the navigation on the left a bit too small. 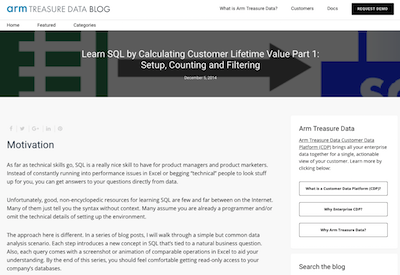 A tutorial that focuses on comparing Excel features to SQL. This tutorial has several ads on the pages which get in the way. The articles are also quite short and poor quality. 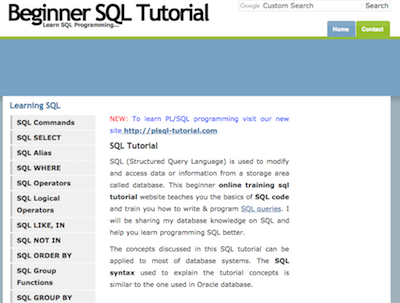 This tutorial is all on a single blog post and uses a command line for SQL. It has a lot of positive comments. The W3Schools tutorial is commonly suggested online in places such as StackOverflow and Reddit. It has a lot of topics. This tutorial explains topics well. It has posts that are easy to follow. This section includes free video tutorials. 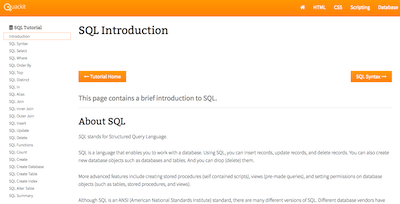 An SQL tutorial on the BitDegree website, which includes a range of videos. Has over 18,000 students enrolled. This includes more than just learning SQL. The enrolment page has some spelling errors so I’m unsure about the quality of the course. 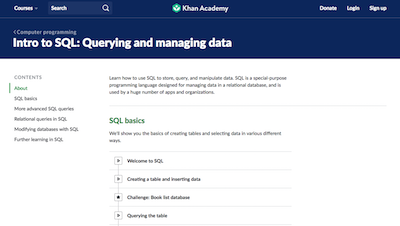 Khan Academy is well-regarded in the industry so I’m sure this is a good quality course on learning SQL. 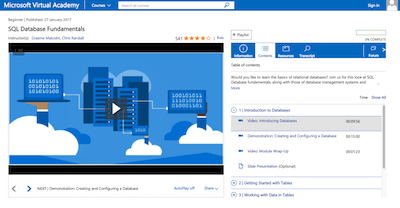 Microsoft offers SQL training on SQL Server. It’s highly rated on their website. 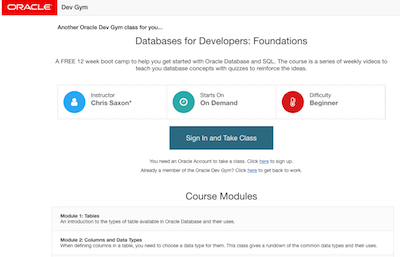 Oracle offers a 12-week bootcamp/course on the Oracle database. I haven’t taken it but I’ve heard good things about it. 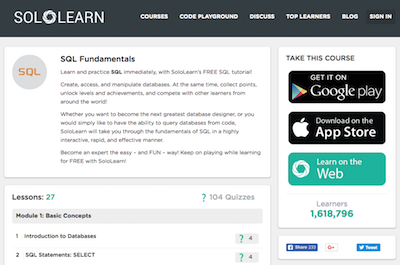 Sololearn offers a range of courses and has gamified the learning process (earning points, unlocking achievements). 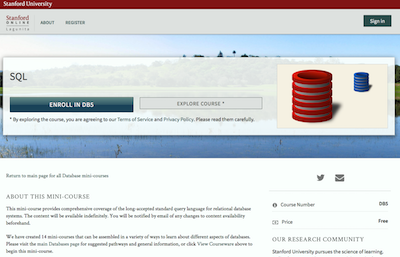 An online course offered by Standford University. Several other courses are also available. This section includes free video tutorials available on YouTube, either as a single video or a series of smaller videos. A series of videos offered by Caleb Curry. 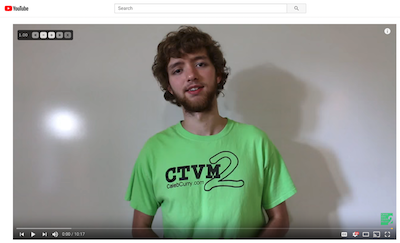 Good quality, great reviews in the comments, and draws concepts on a whiteboard behind him. Also offers courses on other topics. 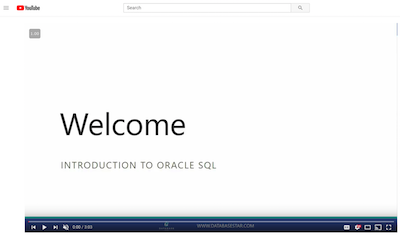 This is my series of Introduction to Oracle SQL videos. I’ve offered it on YouTube and also a webpage on this site that links to all of these videos. 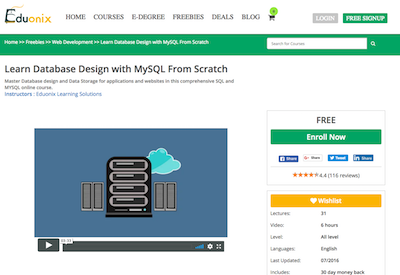 A long video (4 hours 20 minutes) offered by FreeCodeCamp which teaches an introduction to SQL. 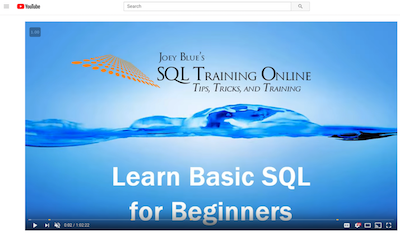 A one hour video teaching the basics of SQL. 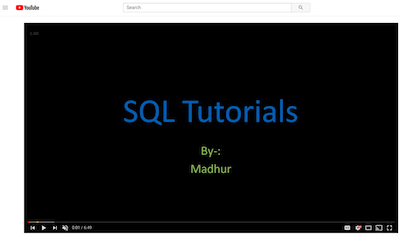 A series of short SQL tutorial videos by Madhur. 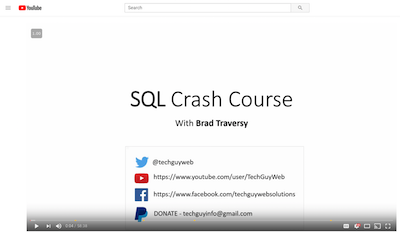 A one hour video by Brad Traversy on the basics of SQL. 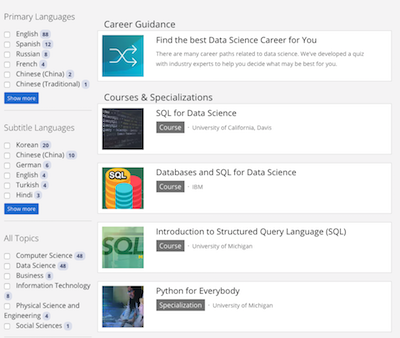 This section includes paid tutorials or courses. 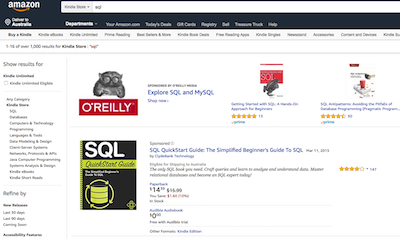 Amazon offers a large range of eBooks on learning SQL. They are usually less expensive than online courses, and using either the Kindle app on your phone or the web reader, you can follow along online. A series of courses offered by CBTNuggets. Focuses on SQL Server and their certifications. A good quality tutorial. 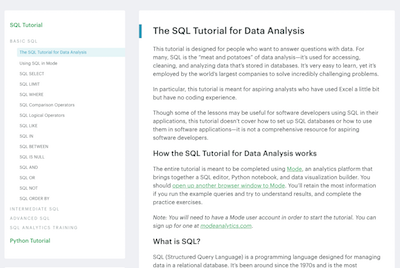 Codecademy is highly regarded in the industry, and it has a lot more than just SQL. 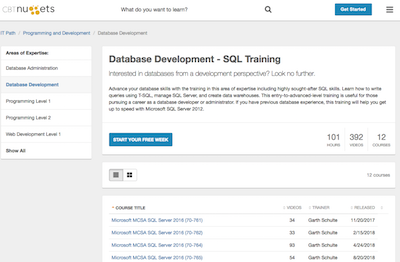 Coursera is a well-known training site and offers a range of courses as well as SQL. 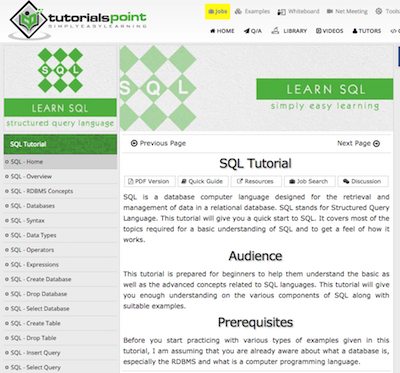 A well-known training site that offers courses on SQL and many other topics. 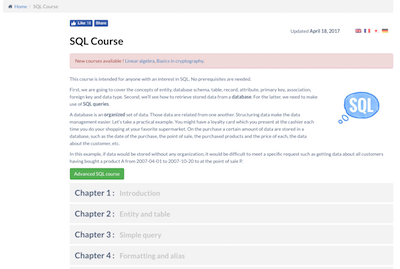 This is an introductory SQL course I developed for Manning Publications, the company who has published a large range of quality books for software developers. 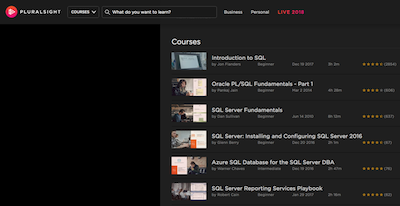 Pluralsight offers a large range of video courses for software developers, and has quite a few on SQL. 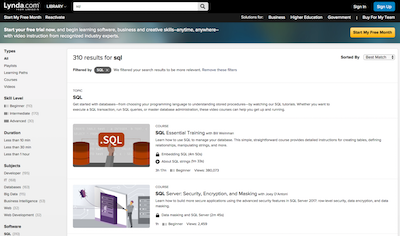 Safari Books Online offers a range of courses, and one of them here is SQL and Relational Databases. Rather than a tutorial, this is a collection of SQL practice problems in text and video format to help you improve your SQL. 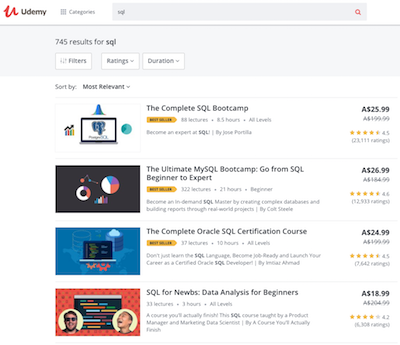 Udemy is an online marketplace for all kinds of courses. 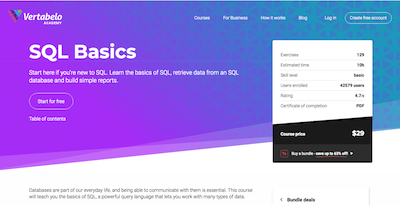 There’s a large range of SQL courses that are suitable for beginners. A very well designed set of tutorials, one of the best I’ve seen. It has a good range of topics and includes exercises. 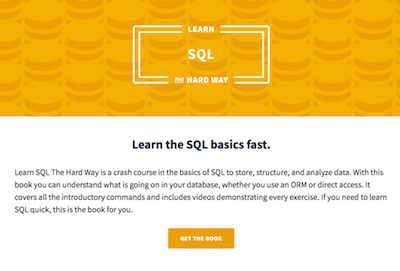 A well-known book for learning SQL, this also comes with videos and exercises. 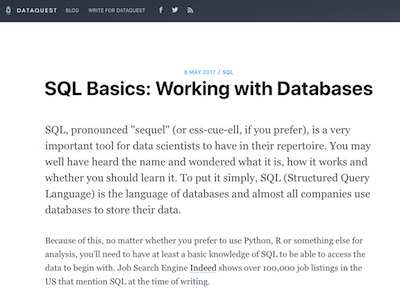 These resources are unique or different methods of learning SQL. 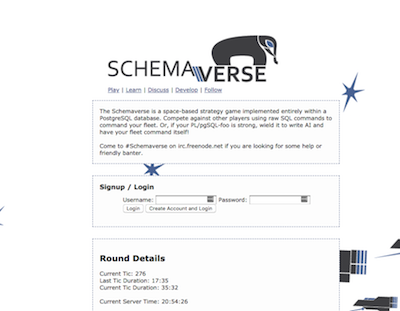 A strategy game where you use SQL to compete against other players. An interesting concept! 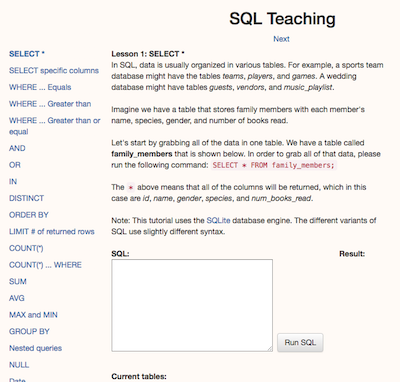 An interactive text-based method for learning and practicing SQL. 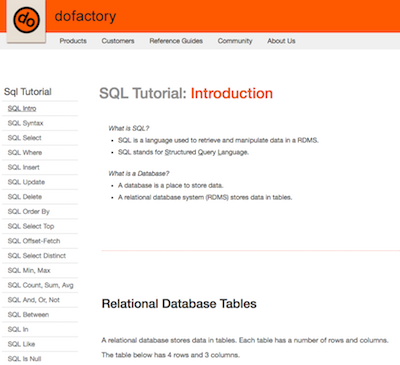 This list contains many different resources for learning SQL. There’s a range of text-based resources (articles and websites), videos, free and paid courses, and even interactive courses. Do you have any suggestions to add to this list? Add them into the comments below and if they meet the criteria I’ll add them here!